Items are grouped into related categories. Please note that some MP3s and scores are available free of charge. New items are added now and again, so come back soon to have another look. 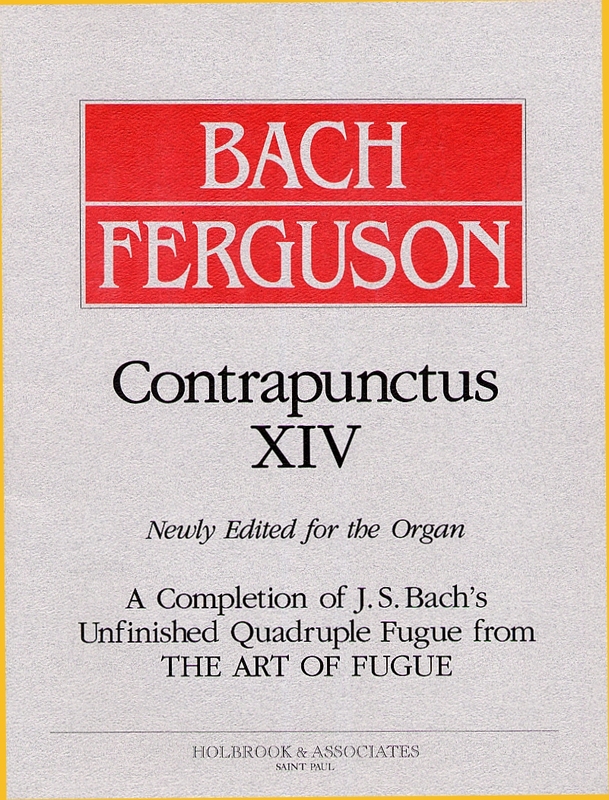 In addition to the new recording of the Art of Fugue, Birolius Editions offers two scores (in different formats) of the completion composed by Michael Ferguson for the last movement, Contrapunctus XIV. Art of Fugue CD page. A "thorough delight... thoughtfully imagined, intricately worked out, and brilliantly realized" — Michael Barone, on Pipedreams, February 27th, 2017. A new composition for solo organ, which explores the full resources of a large instrument. Its three movements of varied character make it useful for church and exciting in recital. 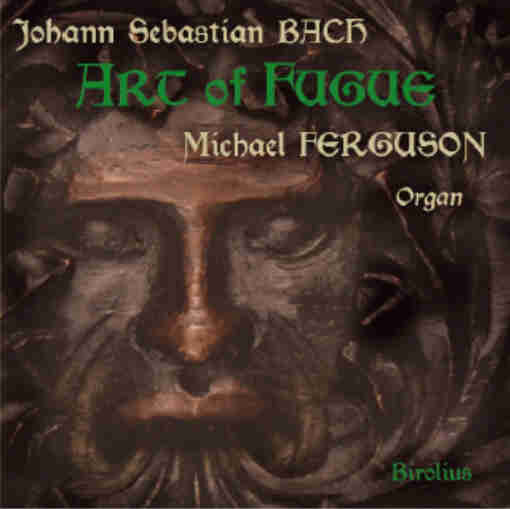 Ferguson's world premiere recording of this work - on the 52-rank, 2007 Casavant organ of Nativity Catholic Church in St. Paul, Minnesota - can be heard on YouTube, along with many other of his compositions, arrangements, and performances. One or more files in each section will always be offered free of charge, and the others will always be offered at the low price of $1.98 each, regardless of length. Scores for some items are also available, listed immediately following the corresponding MP3 file. These performances are all taken from live organ recitals or other musical events. Various details are provided about the music, the organ builders, locales, and so on. From "A Musical Conversation with Johann Sebastian Bach" — a concert presented at University Baptist Church, Minneapolis, on May 21, 1999. 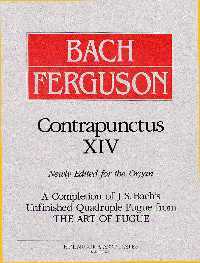 Bach composed this as a prelude to go with the fugue listed immediately below. The organ was built in 1981 by Lynn Dobson as his Opus 15. It has 30 ranks. From the same concert at University Baptist Church mentioned above. Bach composed this fugue on a dare, as an example of something never seen before: a double fugue on three themes. The first theme is in the 'ancient style', and the other two themes are composed as two different types of gigue-theme. Click to listen, or right-click and choose "Save Target As..." to download. Percy Grainger says of his very loose paraphrase that it was "colored by the thought that Bach, in writing the melody in thirds that opens and closes the number, may have aimed at giving a hint of the sound of sheep bells." This comment gives no idea of just how far these particular sheep range over the musical landscape, starting from somewhere rather jazzy, passing by way of Bach's Prelude in D for organ, a tuba-chorus bump-and-grind, and Porgy and Bess, finally arriving in a pleasant vox-humana meadow, with arpeggios. With this piece, Maurice Duruflé won a premièr prix in fugue at the Paris Conservatoire. The year was 1928, and Duruflé was then a remarkable young man of 26. Though his greatest works were yet to be written, this heretofore unknown fugue provides a clear sense of the already astonishing power of his artistic imagination. The fugue is a test-piece, of course, and Duruflé was required to write a pure ‘Bachian’ counterpoint, within a common-practice harmonic framework, upon an assigned theme by Henri Rabaud. Like the other students competing, Duruflé was locked in a room from 6 am until 11:30 pm, provided with only pencil and music paper. No piano, no reference books. Under such circumstances, a real piece of music is about the last thing one would expect as a result. And yet, that is what Duruflé created, and it compels our attention. This world premiere recording of Duruflé’s fugue was made in December, 2004, at the Chapel of St. Thomas Aquinas, at the University of St. Thomas, in St. Paul, Minnesota. The organ was built by Gabriel Kney in 1987, and contains 56 ranks. Click to view file, or right-click and choose "Save Target As..." to download. Duruflé’s fugue was published by Heugel in 1928. It has since passed into the public domain. The score offered here is laid out as an organ performance score, omitting for the sake of readability and simplicity the C clefs and thematic analysis of Duruflé’s original open score. Duruflé’s fugue was published in an edition presenting all four of the fugues awarded a premièr prix in 1928. The other winning fugues were composed by Georges Derveaux, Denis Joly, and Henriette Roget. It was quite unusual for four firsts to be awarded in the same year. Even so, Duruflé's fugue stands forth as a remarkable achievement. This open score presents Duruflé's own thematic analysis, detailing his use of the given theme and the countersubject he created for it, the various divertissements, and the numerous stretti that accumulate at the powerful climax of the last page. These performances are all taken from private recordings, live concerts, or other musical events. Various details are provided about the music, the text, locales, and so on. Based on a Gregorian chant, this piece alternates paraphrases of the chant set for SSATB chorus with quotes of the chant melody itself. Published by Aureole Editions. This work was composed for a Service of Tenebrae at the University Episcopal Center, Minneapolis, to follow Francois Couperin's Trois Lecons de Tenebres. It is a paraphrase not of the traditional chant melody, but of its prosodic rhythms. Published by Paraclete Press. It is here performed at the Cathedral of St. Paul (in St. Paul, Minnesota) by the UEC Chapel Singers, M. Ferguson, director and organist. A setting of the offertory text for the Feast of All Saints, this was another work composed for the University Episcopal Center Chapel Singers. Same performers and locale as for Christus factus est, above. Also published by Paraclete Press. Here are some synthesizer takes of music by Handel and Bach, some very elaborate, some quite simple. This fugue has been very popular with transcribers. Many music lovers will remember a certain a capella choir that sang it in a jazz idiom. As recorded here, with each part overdubbed, more trills are heard than are normally attempted. Many of these compositions are written in a baroque idiom, either for recorder consorts, keyboard, or specifically for the medium of the synthesizer. This came into being as a teaching piece. The theme was developed by the student (Ross Erickson) by elaborating on the theme of Bach’s Goldberg Variations, and the working out was guided by Michael Ferguson. Composed as the first of a group of two movements (the Galliard follows next, below), the instrumentation is for two groups of recorders, like a baroque concerto grosso. Group one has four soloists, arranged SATB; group two has six parts, arranged SAATTB, with perhaps three to a part. When the groups join together, the contrapuntal writing is in ten real parts. This is the movement meant to follow the Pavane, above. Whereas the Pavane was tuneful and easy going, this Galliard is a wild ride through contrasting meters and keys. But why would a composer write two short movements for such a large group of twenty-some instrumentalists? Answer: for the fun of it, as something challenging to be performed by members of the American Recorder Society at one of their annual meetings. Taken from a collection of fourteen canons called Inventioni Curiosi per Sonar, and recorded on a Macintosh computer, with an unnerving steadiness of tempo. The ‘4 in 1’ part of the title refers to the four parts, each entering one at a time, like Row, Row, Row Your Boat, only with a much more complicated melody. Charles Tournemire (1870-1939) was a unique figure in French organ music of the nineteenth and twentieth centuries. A strong influence on the generation of Messiaen, Alain, Duruflé, and Langlais, his music blended an extreme form of late romanticism with the then recently rediscovered modality of the Gregorian chant. Many organists consider him to have been the greatest organ improvisor of the twentieth century. 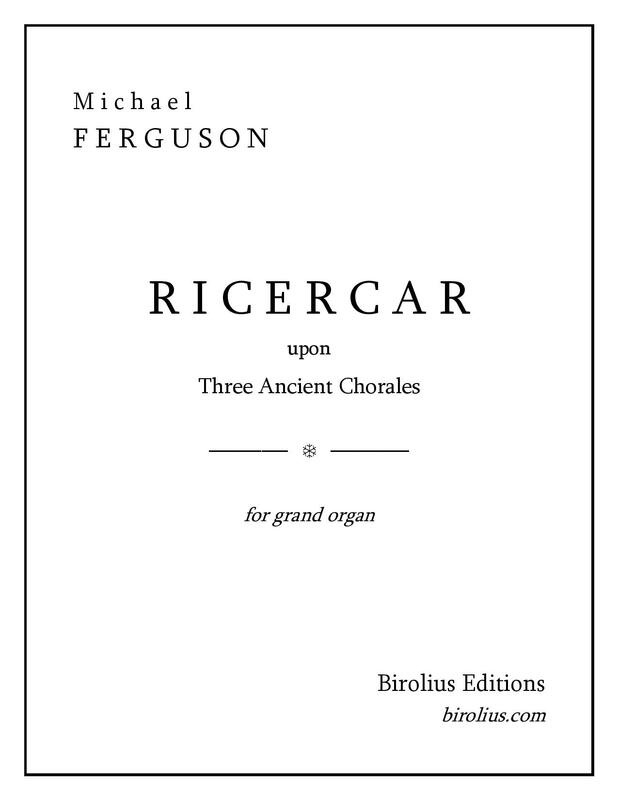 While his larger works for organ cannot make the transition to synthesized sound—dependent as they are on the superb qualities of the best French symphonic organs of his day—his smaller and lighter organ works do quite gracefully, indeed. While you are listening to the free download of Communion 24, you may wish to make a visit to Tom Walker’s website, which includes his entire series of pastel triptych panels created in response to Tournemire’s monumental cycle of organ music, L’Orgue Mystique. Walker’s series of panels, which he calls The Mystic Image, has traveled the globe, and brought greater attention to Tournemire’s music worldwide. This expansive music seems to take place deep beneath the ocean waves. Like much of Tournemire’s music, this Offertory has a sense of time standing still. This music, as so much of Tournemire’s, may remind some listeners of the radio show devoted to ‘Music from the Hearts of Space’. Plucked-string sounds predominate here, with harmonized phrases to round off the various sections.